Die Veneris, videlicet, 29 die Julii. Chapman and Monday in Error. Message to the H. C. that the Lords are ready to proceed against the Lord Mayor. Eales and Covell in Error. Message from the H. C. with an Order to preserve the Peace in Dorsetshire. Answer from the H. C.
Lord Mayor at the Bar. Order for preserving the Peace in Dorsetshire. The Lord Kymbolton was appointed Speaker this Day. The Lord Chief Justice brought in (fn. 1) a Transcript of a Record, for reversing of a Judgement in the King's Bench, inter Chapman contra Monday and his Wife. To let the House of Commons know, that their Lordships are ready to proceed in the Business against the Lord Mayor. Ordered, That Nic. Eales shall assign Errors against Covell within Seven Days peremptorily, or else the Transcript to be transmitted into the King's Bench. Ordered, That this House agrees with the House of Commons in this Order. That the House of Commons will send up some Members of theirs, to manage the Evidence against the Lord Mayor. The Committee of the House of Commons being come, the Lord Mayor was called to the Bar, as a Delinquent; and the Speaker asked Mr. Serjeant Wylde, "Whether he had any further Evidence to give against the Lord Mayor, before his Counsel begins." And he desired, "That Mr. Wiseman, viva voce, might give his Testimony, and some more Witnesses since discovered." Tho. Wiseman, upon Oath, said, "He doth know of Three Petitions, but all to One in Effect, to the King and both Houses of Parliament. 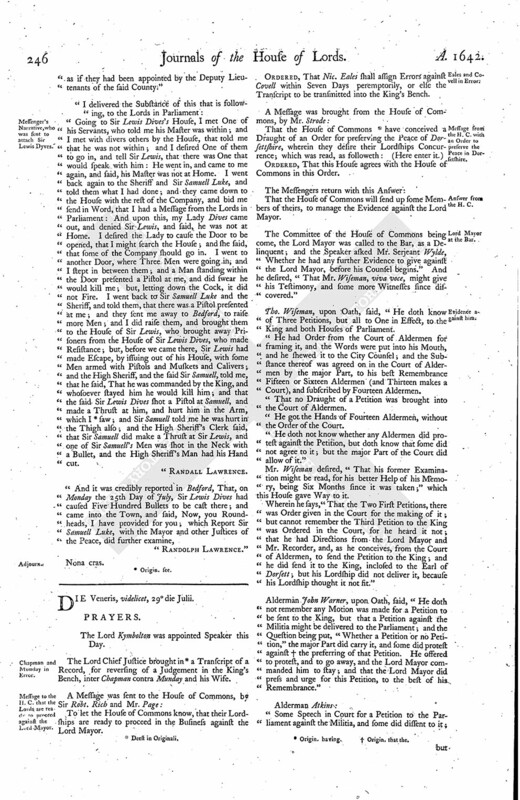 He had Order from the Court of Aldermen for framing it, and the Words were put into his Mouth, and he shewed it to the City Counsel; and the Substance thereof was agreed on in the Court of Aldermen by the major Part, to his best Remembrance Fifteen or Sixteen Aldermen (and Thirteen makes a Court), and subscribed by Fourteen Aldermen. That no Draught of a Petition was brought into the Court of Aldermen. He got the Hands of Fourteen Aldermen, without the Order of the Court. "He doth not know whether any Aldermen did protest against the Petition, but doth know that some did not agree to it; but the major Part of the Court did allow of it." Mr. Wiseman desired, "That his former Examination might be read, for his better Help of his Memory, being Six Months since it was taken;" which this House gave Way to it. Wherein he says, "That the Two First Petitions, there was Order given in the Court for the making of it; but cannot remember the Third Petition to the King was Ordered in the Court, for he heard it not; that he had Directions from the Lord Mayor and Mr. Recorder, and, as he conceives, from the Court of Aldermen, to send the Petition to the King; and he did send it to the King, inclosed to the Earl of Dorsett; but his Lordship did not deliver it, because his Lordship thought it not fit." Alderman John Warner, upon Oath, said, " He doth not remember any Motion was made for a Petition to be sent to the King, but that a Petition against the Militia might be delivered to the Parliament; and the Question being put, "Whether a Petition or no Petition," the major Part did carry it, and some did protest against (fn. 3) the preferring of that Petition. He offered to protest, and to go away, and the Lord Mayor commanded him to stay; and that the Lord Mayor did press and urge for this Petition, to the best of his Remembrance." Some Speech in Court for a Petition to the Parliament against the Militia, and some did dissent to it; but he doth not remember any Petition moved there, for to be sent to the King. 1. A General Order, made in January 13, for the calling of a Common Council as often as he should be required by the Committee. 2. The Order of the 1st of July. "Both which Orders the Lord Mayor hath disobeyed, and neglected to call a Common Council accordingly." The Lord Mayor confessed he had Notice of these Orders. Mr. John Russell said, "That the Lord Mayor had Notice of the First Order, and the Lord Mayor was desired by him and others to call a Common Council about the Arms that came from Hull; and the Lord Mayor answered, That he would acquaint the Court of Aldermen with it." Jo. 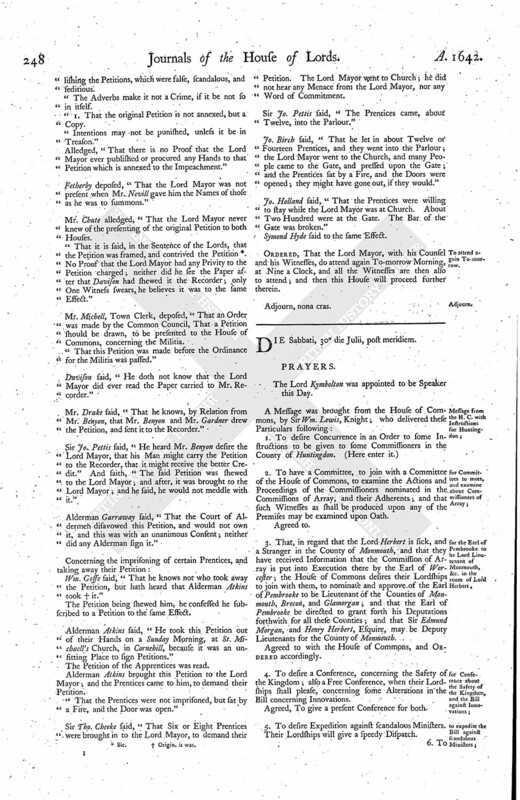 Ven deposed, "That he did deliver to the Lord Mayor the Order of the First July, to call a Common Council, and for the placing of the Magazine. The Lord Mayor told him, he would do it, but he thought there was no urgent Occasions to use them. He told him, There was great Occasion to use the Arms, for the King's Service and the Kingdom. The Lord Mayor told him, The Sessions was to be kept, and he could not call a Common Council. But, when a Common Council was called, he refused to put the Question for disposing of the Arms and Magazine that came from Hull, which was a Neglect of the Command of both Houses." Steven Estwicke deposed, "That, it being long debated at the Common Council, concerning the laying the Magazine, it was desired it might be put to the Question, and certain Places appointed. The Lord Mayor said, He would not put it to the Question; but took the Sword up, and went away." Randall Manwaring deposed, "That every Man at Common Council desired the Question might be put; and the Lord Mayor refused it." And Owen Row deposed, "That he was at the Lord Mayor's when the Cooper was brought in; and the Constable told the Lord Mayor, with a great Deal of (fn. 4) Cross, that he had brought a Man that would have pulled down the Cross; and the Lady said, That the Parties that brought him should be carried into the Buttery, and made much of." Tymothy Felton deposed, "That the Parties that brought the Cooper to the Lord Mayor, drinking a Health in the Buttery to the Lord Mayor, said, That there were a Thousand that would stand for the Lord Mayor and the Cross." Then Mr. Serjeant Wyld desired, "That they might have Liberty to peruse the Examinations taken by the Lord Mayor concerning the Riot." Ordered, That the Lord Mayor and his Counsel shall attend at Three a Clock this Afternoon. 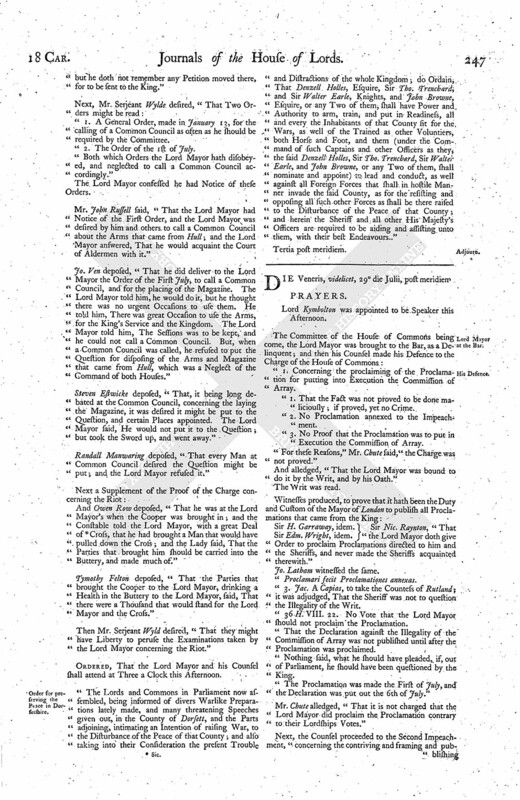 "The Lords and Commons in Parliament now assembled, being informed of divers Warlike Preparations lately made, and many threatening Speeches given out, in the County of Dorsett, and the Parts adjoining, intimating an Intention of raising War, to the Disturbance of the Peace of that County; and also taking into their Consideration the present Trouble and Distractions of the whole Kingdom; do Ordain, That Denzell Holles, Esquire, Sir Tho. Trenchard, and Sir Walter Earle, Knights, and John Browne, Esquire, or any Two of them, shall have Power and Authority to arm, train, and put in Readiness, all and every the Inhabitants of that County fit for the Wars, as well of the Trained as other Voluntiers, both Horse and Foot, and them (under the Command of such Captains and other Officers as they, the said Denzell Holles, Sir Tho. Trenchard, Sir Walter Earle, and John Browne, or any Two of them, shall nominate and appoint) to lead and conduct, as well against all Foreign Forces that shall in hostile Manner invade the said County, as for the resisting and opposing all such other Forces as shall be there raised to the Disturbance of the Peace of that County; and herein the Sheriff and all other His Majesty's Officers are required to be aiding and assisting unto them, with their best Endeavours." Lord Kymbolton was appointed to be Speaker this Afternoon. "1. Concerning the proclaiming of the Proclamation for putting into Execution the Commission of Array. "1. That the Fact was not proved to be done maliciously; if proved, yet no Crime. "2. No Proclamation annexed to the Impeachment. "3. No Proof that the Proclamation was to put in Execution the Commission of Array. "For these Reasons," Mr. Chute said, "the Charge was not proved." And alledged, "That the Lord Mayor was bound to do it by the Writ, and by his Oath." "Order to proclaim Proclamations directed to him and the Sheriffs, and never made the Sheriffs acquainted therewith." Jo. Latham witnessed the same. "3. Jac. A Capias, to take the Countess of Rutland; it was adjudged, That the Sheriff was not to question the Illegality of the Writ. 36 H. VIII. 22. No Vote that the Lord Mayor should not proclaim the Proclamation. "That the Declaration against the Illegality of the Commission of Array was not published until after the Proclamation was proclaimed. "Nothing said, what he should have pleaded, if, out of Parliament, he should have been questioned by the King. "The Proclamation was made the First of July, and the Declaration was put out the 6th of July." Mr. Chute alledged, "That it is not charged that the Lord Mayor did proclaim the Proclamation contrary to their Lordships Votes." Next, the Counsel proceeded to the Second Impeachment, "concerning the contriving and framing and publishing the Petitions, which were false, scandalous, and seditious. "The Adverbs make it not a Crime, if it be not so in itself. "1. That the original Petition is not annexed, but a Copy. "Intentions may not be punished, unless it be in Treason." Alledged, "That there is no Proof that the Lord Mayor ever published or procured any Hands to that Petition which is annexed to the Impeachment." Fetherby deposed, "That the Lord Mayor was not present when Mr. Nevill gave him the Names of those as he was to summons." Mr. Chute alledged, "That the Lord Mayor never knew of the presenting of the original Petition to both Houses. "That it is said, in the Sentence of the Lords, that the Petition was framed, and contrived the Petition (fn. 5) No Proof that the Lord Mayor had any Privity to the Petition charged; neither did he see the Paper after that Davison had shewed it the Recorder; only One Witness swears, he believes it was to the same Effect." Mr. Michell, Town Clerk, deposed, "That an Order was made by the Common Council, That a Petition should be drawn, to be presented to the House of Commons, concerning the Militia. "That this Petition was made before the Ordinance for the Militia was passed." Davison said, "He doth not know that the Lord Mayor did ever read the Paper carried to Mr. Recorder." Mr. Drake said, "That he knows, by Relation from Mr. Benyon, that Mr. Benyon and Mr. Gardner drew the Petition, and sent it to the Recorder." Sir Jo. Pettis said, "He heard Mr. Benyon desire the Lord Mayor, that his Man might carry the Petition to the Recorder, that it might receive the better Credit." And saith, "The said Petition was shewed to the Lord Mayor; and after, it was brought to the Lord Mayor; and he said, he would not meddle with it." Alderman Garraway said, "That the Court of Aldermen disavowed this Petition, and would not own it, and this was with an unanimous Consent; neither did any Alderman sign it." Wm. Goffe said, "That he knows not who took away the Petition, but hath heard that Alderman Atkins took (fn. 6) it." The Petition being shewed him, he confessed he subscribed to a Petition to the same Effect. Alderman Atkins said, "He took this Petition out of their Hands on a Sunday Morning, at St. Michaell's Church, in Cornehill, because it was an unfitting Place to sign Petitions." The Petition of the Apprentices was read. Alderman Atkins brought this Petition to the Lord Mayor; and the Prentices came to him, to demand their Petition." "That the Prentices were not imprisoned, but sat by a Fire, and the Door was open." Sir Tho. Cheeke said, "That Six or Eight Prentices were brought in to the Lord Mayor, to demand their Petition. The Lord Mayor went to Church; he did not hear any Menace from the Lord Mayor, nor any Word of Commitment. Sir Jo. Pettis said, "The Prentices came, about Twelve, into the Parlour." Jo. Birch said, "That he let in about Twelve or Fourteen Prentices, and they went into the Parlour; the Lord Mayor went to the Church, and many People came to the Gate, and pressed upon the Gate; and the Prentices sat by a Fire, and the Doors were opened; they might have gone out, if they would." Jo. Holland said, "That the Prentices were willing to stay while the Lord Mayor was at Church. About Two Hundred were at the Gate. The Bar of the Gate was broken." Symond Hyde said to the same Effect. Ordered, That the Lord Mayor, with his Counsel and his Wintesses, do attend again To-morrow Morning, at Nine a Clock, and all the Witnesses are then also to attend; and then this House will proceed further therein.